Gardeners need a way to compare their garden climates with the climate where a plant is known to grow well. That's why climate zone maps were created. Zone maps are tools that show where various permanent landscape plants can adapt. If you want a shrub, perennial, or tree to survive and grow year after year, the plant must tolerate year-round conditions in your area, such as the lowest and highest temperatures and the amount and distribution of rainfall.Suggested hardiness zones have been indicated for all trees and perennials available online from the Foundation. If a range of zones, for example, zones 4-9, is indicated, the tree or perennial is known to be hardy in zones 4, 5, 6, 7,8, and 9. Suitable hardiness means a plant can be expected to grow in the zone's temperature extremes, as determined by the lowest average annual temperature. Keep in mind that local variations such as moisture, soil, winds, and other conditions might affect the viability of individual plants. You may want to ask a local professional arborist or nursery about which trees to plant in your community. State, regional, and national images of the map can be downloaded and printed in a variety of sizes and resolutions. 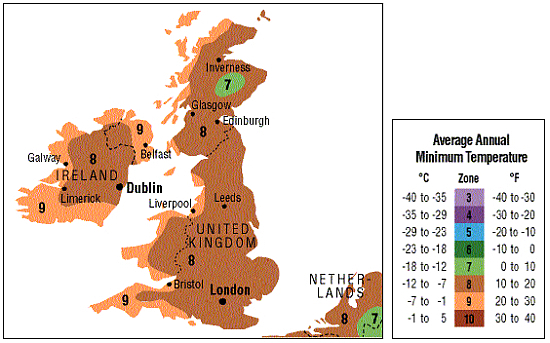 the hardiness zones relevant to Britain and Ireland are quite high, from 7 to 10, as shown below. Zone 7. In Scotland the Grampians, Highlands and locally in the Southern Uplands, in England the Pennines and in Wales the highest part of Snowdonia. Zone 8. Most of England, Wales and Scotland, and parts of central Ireland. Zone 9. Most of western and southern England and Wales, western Scotland, also a very narrow coastal fringe on the east coast of Scotland and northeast England (within 5 km of the North Sea), London, and most of Ireland. Zone 10. Very low lying coastal areas of the southwest of Ireland and the Isles of Scilly. 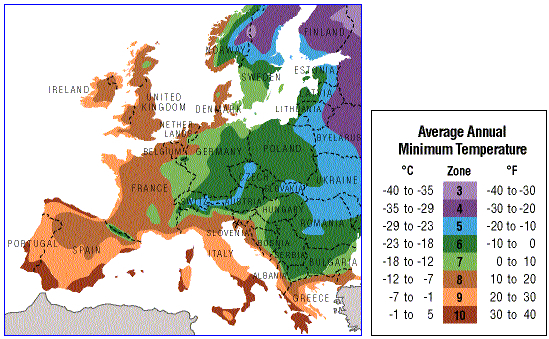 Central Europe's climate is a good example of a transition from an oceanic climate to a continental climate, which can be noticed immediately when looking at the hardiness zones, which tend to decrease mainly eastwards instead of northwards. Also, the plateaux and low mountain ranges in this region have a significant impact on how cold it might get during winter. 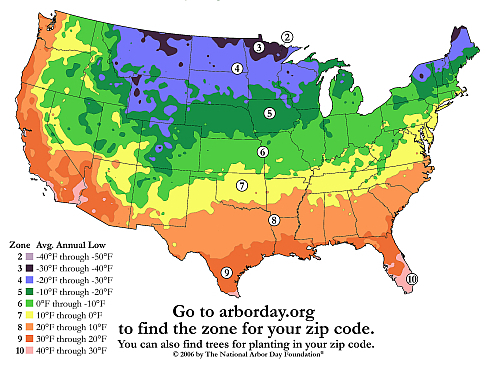 Generally speaking, the hardiness zones are high considering the latitude of the region, although not as high as in the Shetland Islands where zone 9 extends to over 60°N. In Central Europe, the relevant zones decrease from zone 8 on the Belgian, Dutch and German North Sea coast, with the exception of some of the Frisian Islands (notably Vlieland and Terschelling), the island of Heligoland and some of the islands in the Rhine-Scheldt estuary, which are in zone 9, to zone 5 around Suwalki, Podlachia on the far eastern border between Poland and Lithuania. Some isolated, high elevation areas of the Alps and Carpathians may even go down to zone 3 or 4. An extreme example of a cold sink is Funtensee, Bavaria which is at least in zone 3 and maybe even in zone 2. Scandinavia lies at the same latitude as Alaska or Greenland, but the effect of the warm Gulf Stream is even more pronounced here than it is in Britain and Ireland. Save for a very small spot near Karasjok, Norway which is in zone 2, nowhere in the Arctic part of Scandinavia does it get below zone 3. The Faroe Islands, at 62-63°N are in zone 8, as are the outer Lofoten Islands at 68°N. Tromsø, a coastal city in Norway at 70°N, is in zone 7, and even Longyearbyen, the northernmost true city in the world at 78°N, is still in zone 5. All these coastal locations have one thing in common, though, which are cold, damp summers, with temperatures rarely exceeding 20°C, or 15°C in Longyearbyen. This shows the importance to take heat zones into account for a better understanding of what may or may not grow. frost traps, is in zone 5. Zone 4 lies between the Arctic Circle and about 64-65°N, with cities such as Oulu and Jokkmokk, Zone 5 (south to 61-62°N) contains cities such as Tampere, Umeå and Östersund. 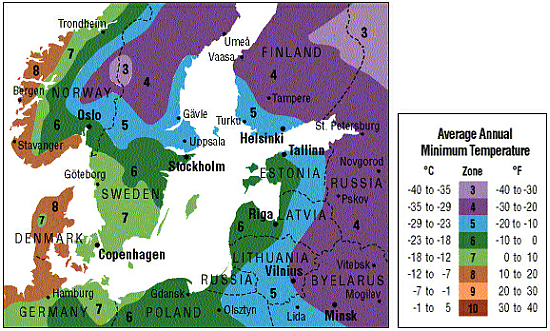 Zone 6 covers the south of mainland Finland, Sweden north of 60°N, and the high plateau of Småland further south. Here one will find cities such as Gävle, Örebro, Sundsvall and Helsinki. The Åland Islands, as well as coastal Southern Sweden, and the Stockholm area are in zone 6. The west coast of Sweden (Gothenburg and southwards) enjoys particularly mild winters and lies in zone 7, therefore being friendly to some hardy exotic species (The Botanical Garden of Gothenburg), the southeast coast of Sweden has a colder winter due to the absence of the Gulf Stream.